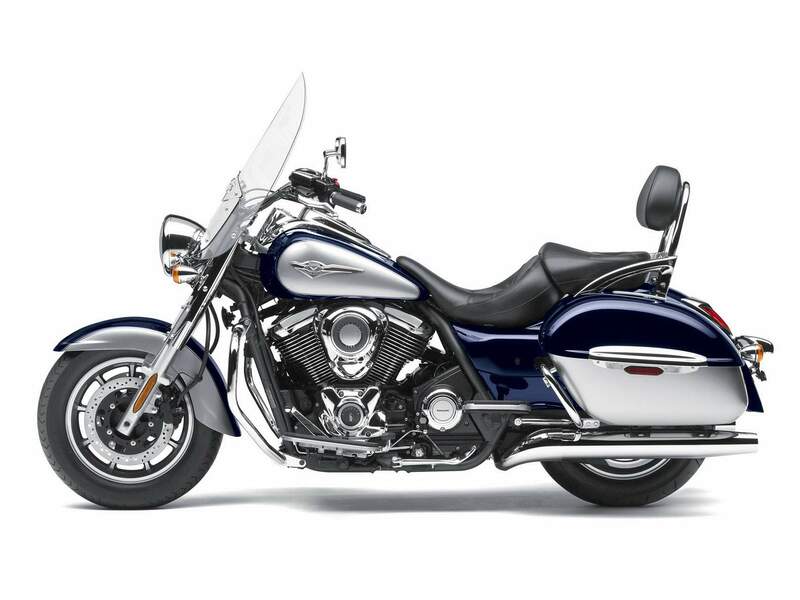 Kawasaki’s new Vulcan® 1700 Nomad™ is more than a touring edition of the innovative Vulcan 1700 Classic. This cruising motorcycle is for riders and passengers who yearn for the open road and nights away from home, but also like to ride in comfort. With a large windshield, hard saddlebags, passenger floorboards, a luxury backrest and standard cruise control, the Nomad is designed for miles of adventure – solo or two-up. The new Nomad supplies serious wind protection courtesy of an adjustable handlebar-mounted windscreen. A sub-windshield and deflectors on the Nomad further increase wind protection performance. The sub-windshield covers the area between the windshield and headlight when the windshield is in the raised position, while the fork-mounted deflectors help direct air away from the rider’s legs. 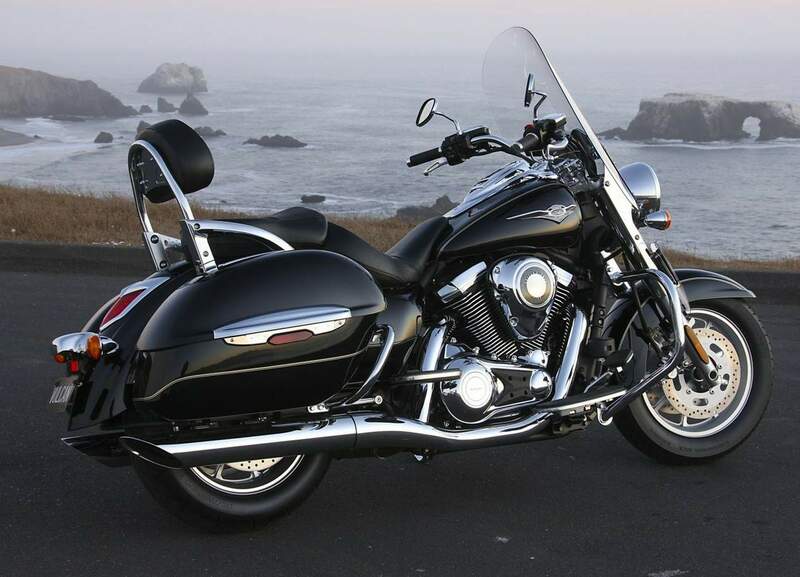 Visually setting the Nomad apart from its Vulcan 1700 brethren are the color-matched, lockable hard saddlebags. These top-opening side cases each offer a bountiful 8.6 gallons (38L) of sealed storage space for overnight trips. The Nomad also features front and rear guards to help protect the bike’s engine and saddlebags in case of a fall. Convenient helmet locks are located on the left- and right-side saddlebag guards. Comfortable seating for the rider and passenger is a must on a touring bike and the Nomad delivers with plush deluxe seats that are sculpted for all-day comfort. Contributing to long-distance passenger comfort is a luxury backrest with integrated passenger grab bars and floorboards for both the rider and passenger. The Nomad’s light, compact frame holds a newly designed 1700cc engine based on that of the mighty Vulcan 2000. However, it uses a SOHC rather than push-rod actuated OHV arrangement. This permits fast revving and quick acceleration from the 1700cc engine – delivering superior passing performance at highway speeds. The new engine’s increase in compression, displacement and long-stroke design means significant torque and power gains over its predecessor. This is no V-twin from yesteryear, the Nomad’s fuel injection system, like those in use on Kawasaki’s Ninja® 650R and Vulcan 900 motorcycles, utilizes one sensor in place of the usual three for less complexity and weight. Besides the obvious advantages of FI like improved fuel economy, the system permits easy hand-off starting. The Nomad’s FI and exhaust are tuned to deliver its peak torque and horsepower at higher rpm – ideal for its open road operating environment. More touring refinement comes from the clutch, which features six damping springs for three-stage progressive damping to smooth out the shifting and the hit from the big 1700cc engine under hard acceleration. More cutting edge technology is found in Kawasaki’s first fully electronic throttle valve system that makes its first appearance on the Nomad. Working together with the fuel injection system, the electronic throttle valve helps the new Vulcan 1700 Nomad to offer a smooth, natural engine response. This helps the ECU to deliver an ultra-precise metering of both fuel and air to the engine. It also provides accurate cold-engine idle speed control, reduces rider fatigue and helps maintain a “natural” throttle feel. The Vulcan 1700 Nomad also features a water-cooled alternator with rare-earth magnets that produces a staggering 48.5 amps of electrical output; plenty to power navigation systems and other electrical accessories that enrich modern traveling. 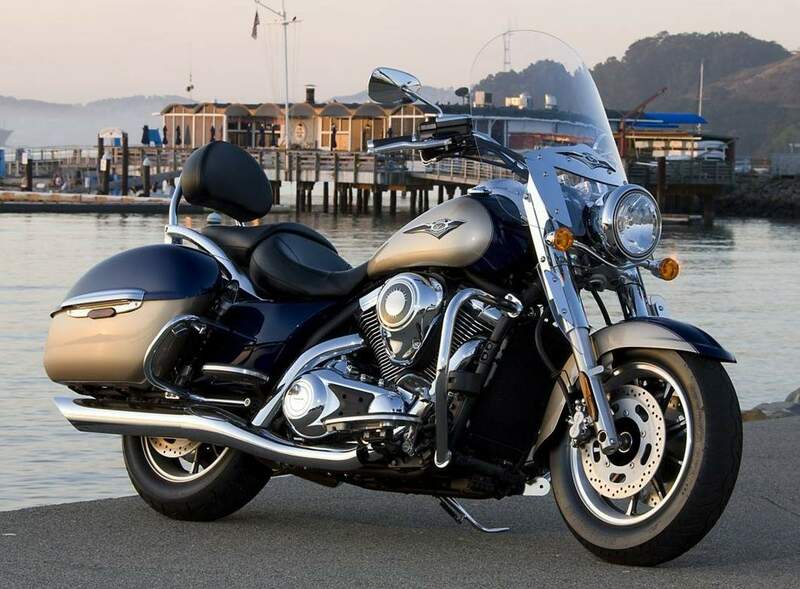 Likewise, no modern motorcycle could call itself a “tourer” without cruise control, and the Nomad is no exception. The cruise control is conveniently operated from the right side of the handlebar and can be activated between 30 and 85 mph in third gear or above. Disengaging is easily done by using the brake lever, clutch lever, rear brake pedal or manually closing the throttle. Moving the Nomad down the road is a new six-speed transmission featuring overdrive and super strong carbon fiber drive belt. The sixth gear functions as an overdrive gear, contributing to relaxed riding and better fuel economy at highway speeds. The new carbon fiber drive belt has a 40-percent higher tensile strength than current Kevlar units, and allows it to use a thin and light 28mm belt. However, this is no cold, mechanical techno-marvel. 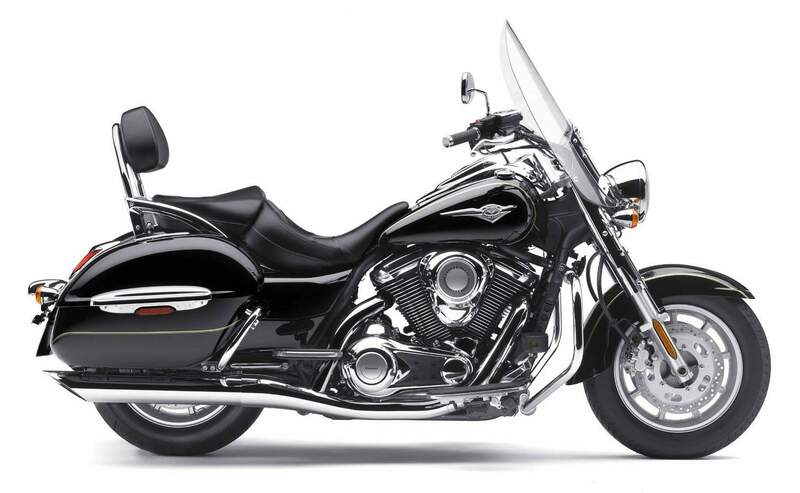 The designers were able to infuse the abundant technology into the new Vulcan 1700 Nomad with all the charm and visual appeal expected on a Kawasaki light touring cruiser. Meticulous attention to detail and exquisite craftsmanship of the engine covers, bodywork design and saddlebags result in an eye-pleasing product that turns heads whether parked in front of a café or cruising down the highway. Adding to the light and easy handling of the low weight chassis design are the new suspension components – set to match the Vulcan 1700 Nomad’s touring performance. Dual adjustable rear air-shocks provide 3.1 inches of travel, and include air adjustable spring preload and rebound adjustment to ensure a comfortable ride feel with unique settings for the Nomad. Up front, a large 43mm fork offers precise steering feedback, four-way preload adjustment and 5.5 inches of travel. The Nomad rolls on new nine-spoke cast wheels, which use tubeless tires and complement its new muscular styling. Mounted on the attractive wheels are a 130/90 front radial tire and a wide, 170/70 rear radial tire. These aren’t the giant size tires that can "dull" handling, but beefy treads that offer good traction, smooth ride and good style. Dual 300mm front disc brakes with twin-piston calipers and a single 300mm rear disc brake with a two-piston caliper bring this show to smooth, powerful stops. A stylish combination of traditional styling, sophisticated technology and touring refinement, the most difficult part of the new Kawasaki Vulcan 1700 Nomad will be deciding which of the three appealing color options to chose; Metallic Diablo Black, Candy Diamond Red / Pearl Luster Beige or Metallic Nocturne Blue / Pearl Luster Beige.